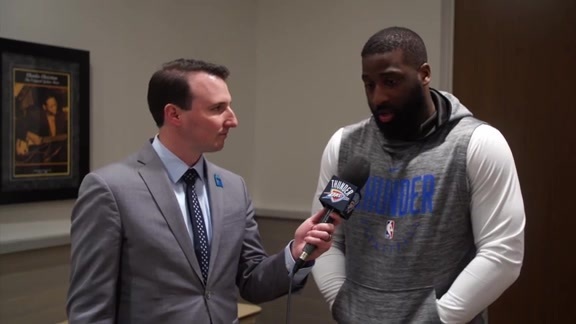 CHARLOTTE – On nine straight halfcourt possessions early in the fourth quarter, Thunder reserve Raymond Felton had the ball out at the top of the key and used a high screen to manipulate the defense. On eight of them, Felton helped generate 20 points through his own shots or assists, as the Thunder ripped off a 22-6 burst in the first 5-and-a-half minutes of the final frame to create all the separation it needed for a 101-91 victory over the Charlotte Hornets. At the Spectrum Center, 115 miles away from his hometown of Latta, S.C., Felton poured it on in the fourth quarter in front of 30 friends and family members who were in attendance to see him play. The longtime veteran point guard won a National Championship at UNC-Chapel Hill, his nephew is now a freshman for the Tar Heels and Felton started his NBA career by being drafted by the Charlotte Bobcats. Undoubtedly, the feisty yet savvy reserve had a little extra pep in his step for this one. Felton followed those orders to a tee, reading that the opposing center was giving ground to him in pick and roll coverage, which freed up drives to the paint and dishes to the perimeter. 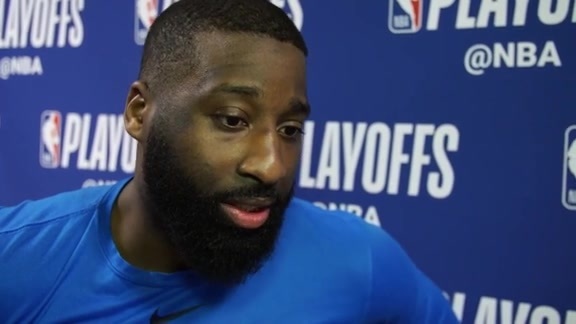 During a four-minute flurry, Felton assisted on three-pointers from all four of his second unit running mates – Josh Huestis, Alex Abrines, Patrick Patterson and Jerami Grant. The last one, Grant’s top-of-the-key splash, made it a 91-84 Thunder lead with 7:18 to go, and the Hornets never got closer than that the rest of the way. During that vital stretch, Felton racked up four assists and eight points, and he also allowed the Thunder’s starters to sneak in a few extra minutes of rest. It paid off down the stretch as Donovan’s group was able to completely clamp down on the Hornets. In the fourth quarter, Charlotte shot just 5-of-21 (23.8 percent) from the field, turned it over five times and made just 2-of-11 shots in the paint due to the Thunder’s switching and disruptiveness. In the fourth quarter the Thunder’s offense was productive, which helped create separation on the scoreboard, but the defensive effort truly began right after halftime. Despite giving up 59 points in the first half, including 12 points in the final 2:26 of the second quarter, the Thunder came out and did a better job of defending without fouling and keeping Kemba Walker out of the lane. The result was just 32 points in the second half for the Hornets, a season-low for a half for Thunder opponents. A microcosm of the difference the Thunder’s defense made in the second half was shown in the rebounding column, as Westbrook, Steven Adams, Carmelo Anthony and Paul George battled possession after possession to prevent Hornets second chances, and to tip out long rebounds for extra cracks at the rim for the Thunder. 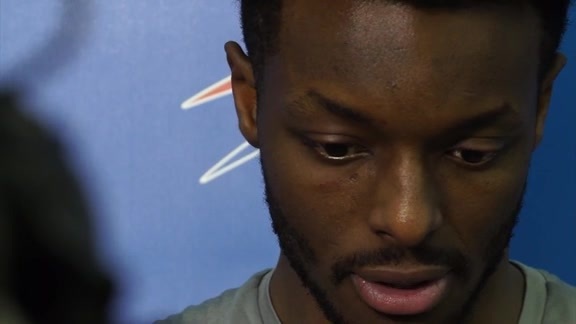 “We got in there and battled, and when we can rebound the basketball, it allows us to play to our strengths which is to try to get out into transition,” Donovan said. Tonight’s win was a much-needed one for the Thunder, and a response from a three-game losing streak that had the team hunkering down to get back to its standards on both ends of the floor. This group will have the chance to back this effort up with two games at home this week, on Monday against Sacramento, and on Wednesday against the Lakers.